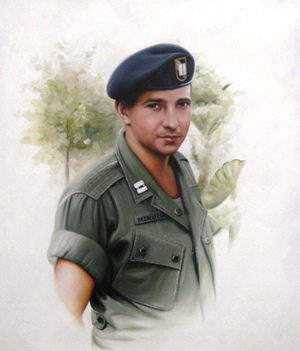 On 06 April 1967, Captain Minutoli and Captain William G. Sipos of the 20th Tactical Air Support Squadron were airborne in an O-1E (tail number 51-5074) about 15 miles west of Danang, flying cover for a Special Forces operation. Both men died when the Bird Dog was brought down by enemy fire. This portrait represents the last known photo of my brother, John Robert Minutoli, before he was killed in a plane crash in Vietnam on April 6, 1967. He was a truly dedicated soldier and endeared himself to many of the children of South Vietnam during times of war. He died too soon. I miss him.